Home» AP LATEST UPDATES | SSC Important Study Material » SSC Physical Science Study Material for Grade D,E Slow learners Study Material Download. AP SSC Physical Science Study Material for Paper 1/Paper 2 Chapter wise Heat (Ushnam), Chemical reaction (Rasayana Charyalu - Samikaranalu) /Scrataring of light (Kanthi Vikhapanam) /Reactions of Acids Bases and Salts (Amlalu - Kharalu- Lavanalatho Charya) / Electricity (Vidhuth Pravaham) / Electro Magnetism (Vidhuth Ayaskanthathvam) /Carbon Compounds (Karbana Samalanalu) / Periodic Table (Visrutha Avarthana Pattika) /Chemical Band (Rasayana Bandham)/ Metallergy (Loha Sangrahana Shasram)/ Reflection of light (Kanthi Pravarthanam) Chapter wise Study Material for SSC Physical Science Slow learners Study Material and Guide Focal Points Important Notes for Question wise Analysis about Physical Science Chapter wise Model Questions Essay and 4 marks/2 marks/1 Marks Questions Multiple choice Questions/ One word Answers Questions/Fill in the Blanks type one mark Questions Chapter wise Physical Science Study Material Download. SSC Chapter wise Subject wise Model Study Material for Physical Science Paper I/Paper II 4 marks/2 marks/1 Marks Questions Multiple choice Questions/ One word Answers Questions/Fill in the Blanks type one mark Questions Chapter wise Physical Science Study Material Useful to Grade/Group D,E Slow learners Study Material for Physical Science Study Material Download in below link. Medium wise Telugu/English Both Medium Study Material for Physical Science Study Material Download. 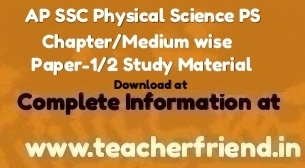 Get Download T.M Physical Science Study Material. Get Download E.M Physical Science Study Material.